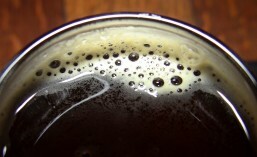 Cascadian Dark Ale is a relatively new craft beer style. The first ones stated showing up in the early 2000’s and, at the time, many of them were were referred to as a “Black IPA” – somewhat of an oxymoron (is it black or is it pale (the ‘P’ in IPA)?). Personally, I’ve always thought they should be called IBA (India Black Ale), since they are, essentially, a dark version of the traditional IPA (with some variations, of course), but that’s another discussion. Regardless of what you call them, Cascadian Dark Ales (CDAs) have become a popular style across the Northwest and indeed the craft beer World at large and several local breweries make great examples of the style. One such brewery is Bellevue Brewing Company (CBM Sponsor), whose version was called the best CDA in the Pacific Northwest in 2013 by SIP Northwest Magazine. 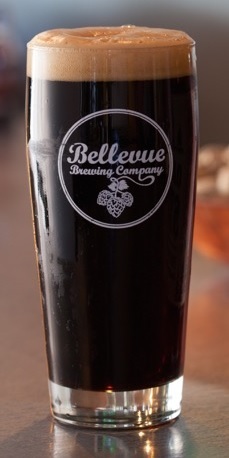 Making it’s return for 2015, Bellevue Brewing’s CDA will return one week from today on Thursday, February 19th. (Eight) beer writers and thirteen brewers gathered at one of the most famous bottle shops in the northwest, Belmont Station, to discuss this new style. The meeting was lead by Abram Goldman-Armstrong, a local beer writer and volunteer point man for promoting this new beer style. Nineteen examples of the proposed new style were present for a tasting and to serve as a basis for evaluating the limits of the style parameters. Industry leaders like Rob Widmer of Widmer Brewing were among the attendees to offer their support and feedback. The plan was to finalize the style descriptors and basic recipe guidelines. Once completed, this information would be forwarded to the Brewers Association (BA), organizers of the GABF, and also to the Beer Judge Certification Program (BJCP) for their consideration. -Flavor: Hop-forward black ale with delicate cedar notes, hints of chocolate, tropical fruit, and coffee. Bellevue Brewing Company is located at 1820 130th Avenue Northeast in Bellevue; just off Northup Way and just a couple of blocks South of highway 520. Drop by today for a CDA and some food from their extensive menu. Their hours are 11:30 AM to 10:00 PM every day, and to 11 PM on Friday’s and Saturdays. This entry was posted in Beer, Beer Release, Bellevue, Brewing, CDA, Food, Seasonals, Washington, Washington Beer, Winter and tagged 2015, beer, Beer Release, Bellevue, Bellevue Brewing, February, seasonal. Bookmark the permalink.